July 28, 2016: σ78 and σ79 are now available! σ78 ("sigma 78") and σ79 ("sigma 79") are DC voltage regulators designed as high-performance replacements for the common 78xx/79xx, LM340/LM320 and LM2940/LM2990 series of 3-terminal IC voltage regulators. * In most cases, a direct swap is possible due to physical, heatsink and pin compatibility. σ78 is a positive voltage regulator, just like the 78xx series, whereas the σ79 is a negative voltage regulator like the 79xx. σ7x offers much lower noise and other improved performance attributes. 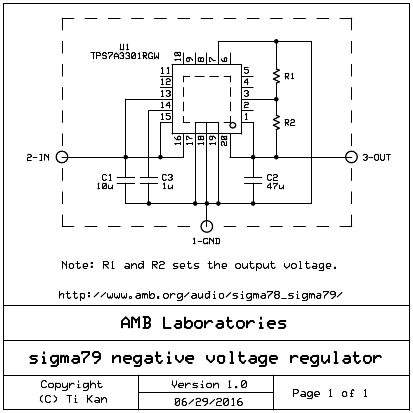 While the 78xx/79xx voltage regulators are "fixed" regulators (i.e., different part numbers for the various output voltages, such as 7815, 7824, 7905, 7912, etc. ), the output voltage of the σ7x is programmable by installing two resistors of the appropriate values on the board (details below), making it possible to achieve custom output voltages unavailable in the 78xx/79xx range. The minimum output voltage for the 78xx/79xx series is +5V and -5V, respectively, whereas the σ7x support outputs down to +1.8V and -1.8V. Also, σ7x is based on LDO (low dropout) technology so it could maintain excellent regulation with a lower input voltage (500mV vs. 2.5V for the 78xx/79xx), reducing heat dissipation and increasing efficiency. σ7x can be installed in existing equipment as an upgrade, or used in new designs. No other modification to the target circuit is necessary. 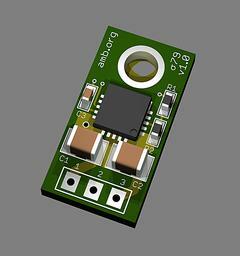 σ78 is an ideal upgrade for the σ25 power supply board, and σ79 is similarly excellent for the σ26. The CK²III headphone amplifier is a good upgrade target with the σ78 and σ79, configured to output +15V and -15V. * Note: The 78xx/79xx, LM340/LM320, LM2940/LM2990 regulators are available in a variety of package styles, but σ7x is intended to be compatible only to those with a TO-220 package. 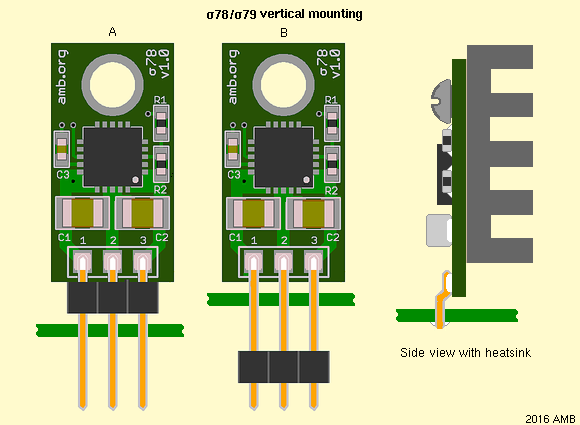 In some cases, if there is sufficient space on the board, σ7x can be used to replace the 78Lxx/79Lxx regulators in TO-92 package (note reversed pin-out on the 78Lxx). There are several manufacturers of the 78xx/79xx, such as Fairchild, On Semiconductor, Texas Instruments, STMicroelectronics, etc., with different part number prefixes (e.g., LM, MC, KA, L and µA). σ78 is based on the Texas Instruments TPS7A4701RGW ultra low noise positive LDO voltage regulator, a 5mm x 5mm QFN-20 surface-mount device with power pad on its bottom side. The board also integrates the needed support parts (input and output decoupling capacitors, noise reduction capacitor and output voltage programming resistors). Three solder pads are provided instead of pins, so that you could use the most convenient method to connect the device to your circuit, such as with pin headers or resistor lead cut-offs. σ79 is similar except it's based on the Texas Instruments TPS7A3301RGW negative LDO voltage regulator, in the same QFN-20 package and pin-out as the TPS7A4701RGW. Both the positive and negative regulators feature soft start, over-current protection, and thermal shutdown. The input voltage range is +3V to +35V (σ78) and -3V to -35V (σ79). The maximum supported output voltage is +24V (σ78) and -24V (σ79), which are limited by the voltage rating of the output decoupling capacitor. The recommended minimum dropout voltage (difference between input and output) is 500mV. The maximum supported current is 1A, but depending on the dropout voltage and heatsink efficiency, the device may be constrained to a lower current due to power dissipation. The circuit design is a straightforward implementation of each regulator chip, and the board layout is a direct adaptation of the recommendation from the datasheet for optimal performance. The high quality boards are 0.4125" (W) x 0.8000" (H) (10.48mm x 20.32mm) with a thickness of 0.062" (1.58mm). The board material is FR-4 glass epoxy, with two copper layers, soldermask on both sides, and silkscreen. The component side of the σ7x board has a square copper area matching the power pad on the bottom of the regulator chip, and has 9 through-plated holes to help conduct heat to the back side ground plane. The back side of the board is flat and can be mounted against a heatsink with thermal paste. A TO-220 compatible mounting hole is provided. Since it is virtually impossible to hand-solder the regulator chip to the board, each σ7x will be supplied with the appropriate chip pre-mounted. You'll still need to purchase the resistors, capacitors, pins/leads separately (see Parts list below), and hand-solder them. This helps to keep the cost down. Please see the σ7x development thread at the AMB DIY audio forum for more information. 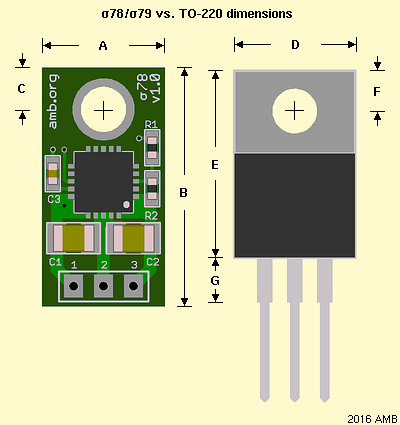 The following picture illustrates the σ7x dimensions compared to a typical TO-220 package. Be sure to check your application for proper fitment. σ7x is panelized (as an array of boards) during production and then snapped apart into each board, therefore the edges may cause the board to be very slightly oversized. If this is a problem, you can sand the edges down a little with a sandpaper or flat file. TO-220 devices can are typicaly mounted either vertically (perpenticular to the application board surface) or horizontally (flat against the application board). σ7x can be similarly mounted, but due to the provision of pads instead of pins, the following should be considered, especially when installing the σ7x in existing equipment. 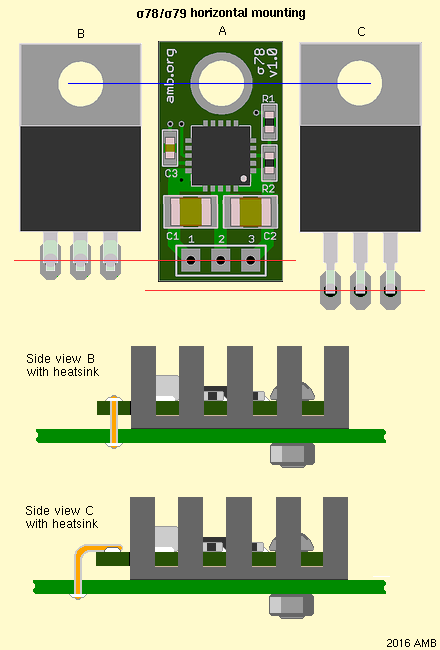 For vertical mounting, there are two recommended ways to connect the σ7x to the application board via a 3P pin header, as shown in the illustration above. Method A can be used if there is enough space below the σ7x to fit the pin header body between the σ7x and the application board surface. 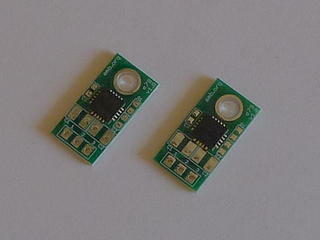 This method can be used when installing the σ7x on the CK²III headphone amplfier board. Method B should be used if there is not enough space for the pin header body. The body can be cut off after soldering. Both methods require that you solder the pin header to the σ7x "surface-mount style", where the pins are placed horizontally on the σ7x pads and soldered down. The pins should not be inserted into the solder pad holes. The areas to be soldered are depicted in white in the picture above. In some cases, you may need to form the pins to make it align properly with the application board, this is shown in the side view above. You should bend the pins before soldering them to the σ7x, to prevent stressing the solder pads and causing it to delaminate from the board. Instead of a 3P pin header, you can use resistor lead cutoffs to connect the σ7x to the appiication board. Resistor leads are more flexible to form into the desired shape, but you should still solder them "surface-mount style" to the σ7x component side, without inserting into the holes. For horizontal mounting, the TO-220 package sits parallel to the application board, with its pins bent 90° downward to meet the solder pads. The location of this bend, relative to the mounting hole, is not standardized (see B and C in the illustration above, the blue line shows the alignment of the mounting holes). When replacing with a σ7x, the σ7x solder pads may or may not align closely to the corresponding pads on the application board. If the alignment is good (see red line between A and B), then for each of the σ7x's three terminals, you can insert a pin or resistor lead cutoff through both the application board and the corresponding σ7x solder pads, and solder them together (Side view B). This is the only case when pins are inserted through the σ7x's solder pad holes. The σ7x is designed to fit the σ25/σ26 perfectly, thus this scheme should be used for these boards. If the application board pads do not line up well with those on the σ7x (see red line between A and C), then use the second scheme (Side view C). Either a resistor lead cutoff or a 3P pin header should be bent 90° and then soldered to the component side of the σ7x "surface-mount style", without inserting into the holes. Some equipment use horizontal mounting, but with the back side facing up. You can use the same recommendations as above, but the pins or resistor lead cutoffs must be soldered first. When soldering pins or resistor lead cutoffs to the σ7x, always solder them to the pads on the component side of the board. If you're using resistor lead cutoffs, choose thick leads over thin ones for lowest impedance. The exposed copper area (solder plated) on the back of the σ7x, and the ring around the mounting hole is "ground". This is compatible with the 78xx regulator, but not the 79xx (whose back side and metal mounting tab is internally connected to the input pin). This is not usually a problem if the heatsink is isolated. You should check the target application to make sure that this does not pose a problem. The holes for the three terminals on the σ7x are through-plated and have small conductive annular rings around them on the back side of the board. If your heatsink does not have a cutout to clear this area when the σ7x is mounted, then the heatsink may cause shorts between the terminals. After mounting the σ7x, always use your multimeter to check for continuity between each pin to the heatsink. Only the ground pin (pin 2 on σ78, pin 1 on σ79) should have continuity. If the input or output pins are shorted to ground, then you should use an isolation pad. All soldering should be done on the front (component) side of the σ7x. Never solder on the back side of the boards, including the holes for the three terminals. When σ78 is used on the σ25 board, and when σ79 is used on the σ26 board, it is not necessary to use a TO-220 mounting kit with isolation pad. This is also true if you are using the σ7x on the CK²III headphone amp board with the specified heatsinks (black anodized and electrically isolated). Just apply some thermal paste between all mating surfaces. The following is the parts list for one complete σ78 or σ79. Vendor stock numbers are provided for Mouser, Digi-Key, Farnell and RS Components. The σ7x boards and optional 3P pin headers are available from AMB audio shop. The output voltage is programmed by the values of the R1 and R2 resistors. Note that the R1 and R2 designations are reversed from those in the Texas Instruments datasheets. The input voltage must be at least 500mV higher than the output voltage to maintain good regulation. The following table lists some common voltages and their recommended resistor values. in the TPS7A3301 datasheet for lower noise. The following is a table of resistor stock numbers from Mouser, Digi-Key and Farnell. RS Components does not offer these in single quantities. Note: Yageo RC series resistors are listed for Mouser and Digi-Key, and Multicomp MC series are listed for Farnell. You may substitute with resistors from other manufacturers as long as they are the correct values, ±1% or better tolerance, and with imperial 0603 (metric 1608) case style. If you need an output voltage not listed in the table above, use the following information to calculate the proper resistor values. You can make minor adjustments to the calculated resistances to make them match available E96 (1%) or E192 (0.1%) standard EIA resistor values. Then plug in the resultant R1 and R2 values into the Vout formula above to determine if the output voltage is close enough to your target. A good soldering iron with fine tip, preferably with adjustable temperature. For example, a Weller WLC100 with ST6 tip. A more deluxe soldering station such as the Weller Weller WES51 or Hakko FX888 is nice, but not necessary. Thin gauge solder, such as 0.025". Your choice of 60/40 or 63/37 tin/lead. Avoid silver solder as it requires high heat. Lead-free solders also require higher heat and their durability is still in question. Chip Quik® SMD desoldering kit (if needed). Vision aid, such as magnifier lamp, loupe, magnifying eyewear (e.g., Fisherman Eyewear Flip-n-focus), etc. The regulator chip comes pre-soldered to the board, so there are only 5 parts you need to install: C1, C2, C3, R1 and R2. If you're new at soldering surface-mount devices, please view the following video, an excellent tutorial. C1 and C2 are imperial 1210 or 1206 (metric 3225 or 3216) devices. C3, R1 and R2 are imperial 0603 (metric 1608). See the Topline Chip codes page and the Wikipedia Surface-mount technology page (section 7) for details about these case styles. Solder each part on the board in their respective locations. None of the 5 parts are polarized. You may want to start with the largest parts first, then work on the smaller ones. Work on one part at a time. Apply liquid flux to the pads. Clean your soldering iron tip and load a small amount of solder on it, and then touch the tip on one of the two pads to transfer the solder to the pad. Using your tweezers, place the part over the pads. Be careful not to drop or lose the part, you may never find it again. Heat the pad where you deposited some solder to melt it, while simultaneously press down with your tweezers, thereby allowing the part to sit flat against the board. The solder should immediately flow and smooth out into a shiny wedge-shaped fillet with help from the flux. Check the alignment of the part and if necessary, make adjustments with your tweezers while heating the pad that you just soldered. When you're done with one side of the part and are happy with the outcome, then apply more flux, press the tweezers on the part to prevent it from moving, and solder the other side. Again, the solder should flow and form a nice shiny fillet. Repeat the above steps for each of the 5 parts. When all parts are soldered, clean the board with isopropyl alcohol or electronics flux remover spray (and use a small brush if necessary) until all the flux residue is gone. If you ever need to remove a part from the board, and do not have specialty SMD rework equipment, then use Chip Quik® as listed above. Once the part is removed, clean up the pads by applying some flux to desoldering braid and heat it against the pads with a brushing motion. Do not overheat the pads to prevent them from delaminating from the board. See the Application Notes section above about mounting the σ7x in your device. Use your multimeter in Ohms mode to check for shorts between each of σ7x's input, ground and output pins, in all combinations and orientations. The onboard capacitors may cause your meter to briefly register a reading, but should quickly read "infinite" thereafter. Any additional testing will need to be done when your σ78 or σ79 is installed in the target circuit. You should once again check for shorts between its pins before powering up for the first time. If all seems well, then power up and check the output voltage. You should also monitor U1's temperature to make sure that there is sufficient heatsinking and ventilation. The temperature directly over the center of the chip should not exceed 70°C. † Note that this is different than the 79xx. All rights reserved. Commercial use of this design is prohibited without prior permission.